To keep your New Jersey commercial property looking its best, you need to focus on keeping every one of its components looking clean and beautiful. When it comes to your parking lot and parking garage, you can easily keep things clean and beautiful by calling the pressure washing experts at AAA Pressure Wash.
Our New Jersey pressure wash professionals will remove months and even years of stains and other eyesores with our commercial parking lot and garage cleaning services. We’ll provide quick and thorough results that will ensure your commercial property will look its absolute best, guaranteed. You’re in business to make money, not lose it on unnecessary problems. So, to keep the above-mentioned problems from happening, you need to take steps to ensure that it likely won’t happen. 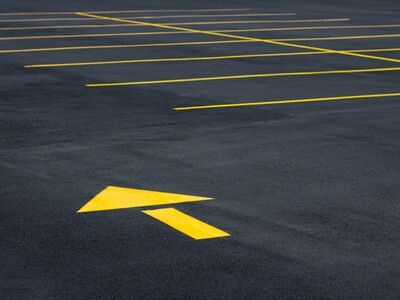 To do that, simply get regular parking lot and garage cleaning work from us to remove oil spills and the like. Still, it’s important that your New Jersey business look its best. After all, customers are more likely to go to a good-looking business than an unsightly one, and to ensure that your business looks its best, you need to call for our commercial pressure washing services. Whether you’re in the market for a garage cleaning, a roof cleaning, or any other kind of cleaning service that we offer, you can be sure that we’ll get your business looking its best. Since a beautiful business can be a successful one, you’ll find our services to be a great investment. If you are looking for a Parking Lot and Parking Garage Cleaning service in the Northern New Jersey area, please call us today at 888 – 857 – 5441 or complete our online request form.